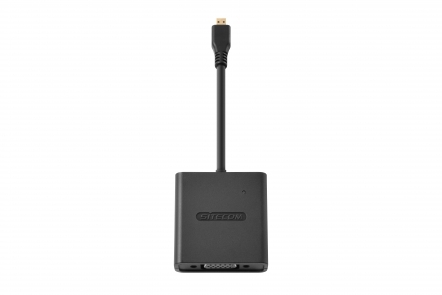 The CN-355 Micro-HDMI to VGA Adapter + Audio Adapter from Sitecom lets you connect your Micro-HDMI devices like notebooks, tablets and smartphones to a TV, monitor or projector that uses VGA and to a set of speakers or a soundbar. You can also use the adapter to extend your notebook’s desktop to a larger screen and increase your productivity or mirror the content to let your audience see what you are seeing. 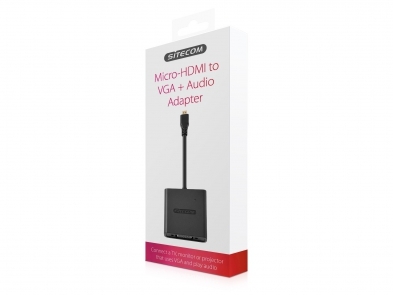 The Micro-HDMI to VGA Adapter + Audio Adapter supports a maximum resolution of 1920 x 1200 pixels and provides a crystal-clear viewing experience on every screen. The adapter is fully Plug & Play out of the box. Simply plug the adapter into a free Micro-HDMI port on your computer, no drivers needed. The adapter is compatible with all operating systems.